NETWORK FINALS: There were 0.1 bumps for THE CATCH, THE BIG BANG THEORY and LEGENDS OF TOMORROW in final numbers. CABLE HIGHLIGHTS: ESPN’s NBA PLAYOFFS game was in the driver’s seat of Thursday cable with 2.07. Univision’s LIGA Soccer match continued the sports motif with a 0.73 match. (NBC Sports Net’s NHL PLAYOFFS game lagged at 0.41.) A&E’s 60 DAYS IN dropped 0.06 to 0.72. USA’s WWE telecast was down 0.04 to 0.67. Spike’s LIP SYNC BATTLE fell 0.03 to 0.47. Cartoon Network’s STEVEN UNIVERSE hit the Top 10 at 0.46. On History, ALONE was steady at 0.46, and MOUNTAIN MEN was at 0.42, up 0.11 from last week’s special episode, with JOIN OR DIE down to 0.13/0.12 compared to last week’s 0.14 for a single episode. 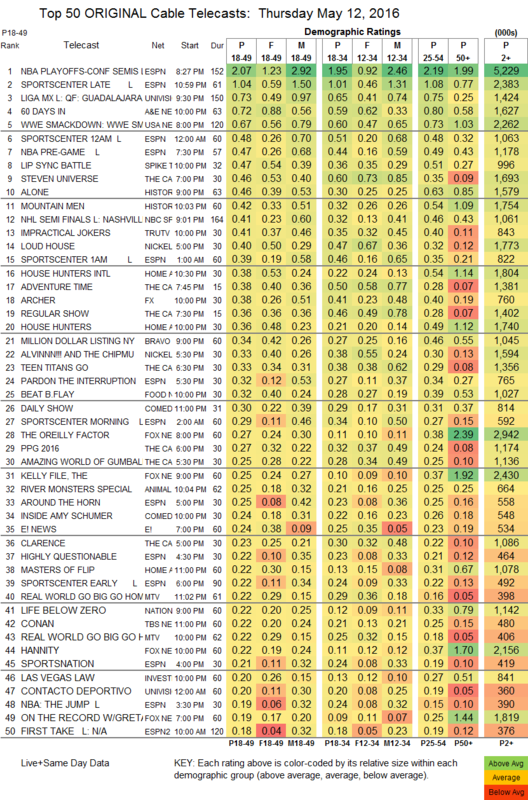 Tru’s IMPRACTICAL JOKERS gained 0.04 to 0.41, and COMEDY KNOCKOUT was up 0.03 to 0.15. On HGTV, HOUSE HUNTERS INTL ticked down to 0.38, and HOUSE HUNTERS was down 0.04 to 0.36, with MASTERS OF FLIP down 0.07 to 0.22. FX’s ARCHER edged down 0.02 to 0.38. Bravo’s MILLION DOLLAR LISTING rose 0.06 to 0.34. Food Network’s BEAT BOBBY FLAY lost a tick to 0.32. Comedy Central’s INSIDE AMY SCHUMER shed a hundredth to 0.24. MTV’s REAL WORLD lost 0.03 to 0.22, and an additional episodethe after-show was at 0.22, with the late after-showan additional midnight special steady at 0.16. We’s SISTERS IN LAW fell 0.04 to 0.08. 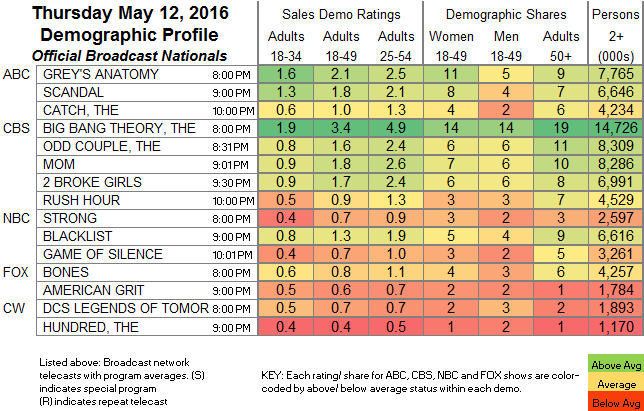 BBCAmerica’s ORPHAN BLACK was steady at 0.08, and post-show AFTER THE BLACK was also steady at 0.05/110K. In response to a reader request, Boomerang’s PEANUTS was at 0.04/77K.